Hennessey Performance unveils their latest sport pickup. Introducing the Hennessey Heritage Edition F150. 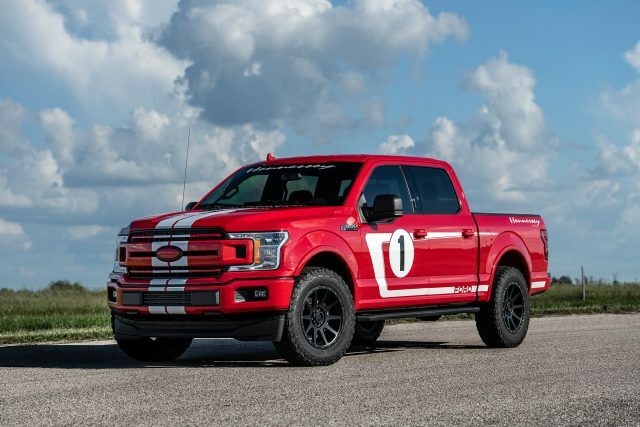 This special edition truck is available for the 2018 and 2019 F150 equipped with the 5.0-liter V8. It creates 758 horsepower at 7,000 rpm or 570 rear wheel horsepower. The upgrade includes performance equipment such as a 2.9-liter supercharger, air-to-water intercooler, stainless steel cat-back exhaust, and high-flow air induction. This special edition is easily identifiable with its Heritage Edition graphics, Hennessey badging, and serialized dash and engine plaque. There’s also a couple of upgrade packages available for this special edition. The Sport Kit upgrade includes a lowering kit, sway bars, Brembo brakes, and 22-inch wheels and tires. The Off-Road upgrade features a Hennessey front and rear bumper, 20-inch Hennessey wheels with 35-inch tires, and a front suspension leveling kit. With winter and Christmas approaching, this would make the perfect sleigh for Santa to reach those places the reindeer would fear to tread. The package price starts at $74,500 which includes the cost of the F150. For more information, check out hennesseyperformance.com.